Front page favourite Manhole Man, making his 25th cover appearance, joins Cheeky in kicking off this second birthday issue with a whirly-bird witticism, rendered by Jimmy Hansen. Sadly there's no mention of the second anniversary on the cover, nor anywhere inside (neither were there any celebrations of the 100thedition). This is the only time that Jimmy Hansen drew the main cover feature. Jimmy Hansen continues to draw Cheeky's Week as the action progresses to the Sunday page, wherein our toothy pal is depicted dispensing quips along with newspapers on his regular round. Readers who have sent in Paddywack gags will be eagerly scanning this week's bumper 2-page feature to see if their joke is among the 6 that the editor has chosen to be illustrated by Jack Clayton. 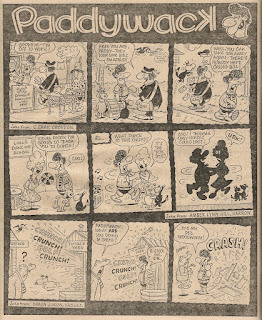 It's not the first time that there has been a double helping of Paddywack – the issues dated 17 and 24 February and 28 July 1979 all contained 2 pages of the braces-and-welly-sporting buffoon. 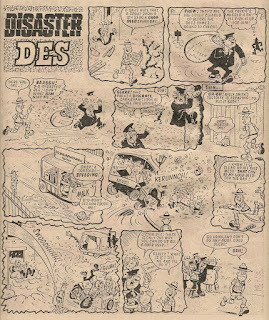 This week we learn that Disaster Des is, somewhat improbably, a Boy Scout. Mike Lacey returns to drawing the strip after Jimmy Hansen deputised last week. The Man In The Plastic Mac finds himself as The Man In Nothing At All by the end of this week's Elephant On The Run. 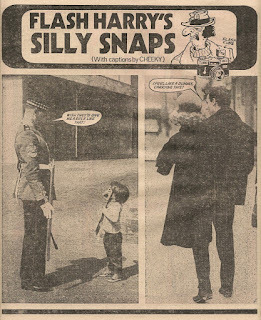 The Silly Snaps filler reaches the last of its murky, grey outings this issue. I suspect few readers will mourn its departure. 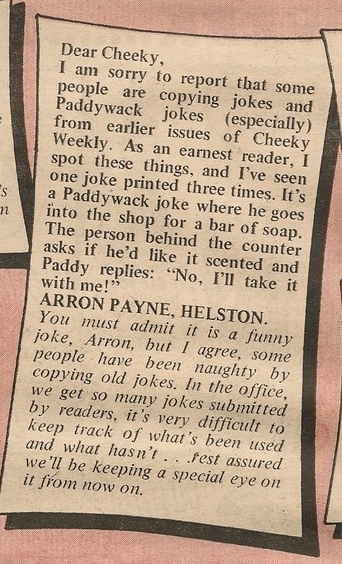 The Chit-Chat page contains a letter complaining of the recycling of Paddywack gags – fortunately the joke in question is not among those featured in this week's double helping. Mike Lacey takes on the Cheeky's Week artwork duties as of Thursday, and on Friday, Lily Pop's response to Cheeky's gag about Paddywack comes perilously close to eliciting a further critical missive from the eagle-eyed Arron Payne. The IPC coffers must be brimming as, along with the Paddywack 2-pager, there's a double-page Joke-Box Jury, and printed contributions to both features win a cash prize. Cheeky's vigilant correspondent from Helston need not wring his hands as none of the Jury Jokes are soap-based. Barrie Appleby stands in for Frank McDiarmid for the second (and final) time on Snail of The Century, which brings this week's fun-fest to a slithering conclusion. Sadly there's no Frank McDiarmid work in this issue, but the Cheeky's Week art duties are more than capably shared between Jimmy Hansen (this week's issue is the final time that Jimmy will draw Cheeky's Week, although he'll continue to provide the art on Speed Squad), Mike Lacey and Barrie Appleby (4, 4 and 1 elements respectively). New readers start here... After Cheeky Weekly folded and was incorporated into Whoopee as of February 1980 six strips that had originated in the toothy funster's title survived the merge and continued to appear in the amalgamated comic. Whoopee itself foundered in March 1985 and was merged into Whizzer and Chips. 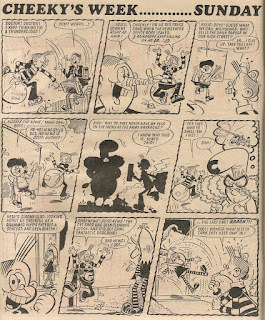 Three of the surviving Cheeky Weekly strips successfully negotiated this second merge and went on to appear in the newly combined publication, rather inelegantly titled 'Whizzer and Chips now including Whoopee'. The survivors were Mustapha Million, Calculator Kid and (appearing only twice) Stage School. 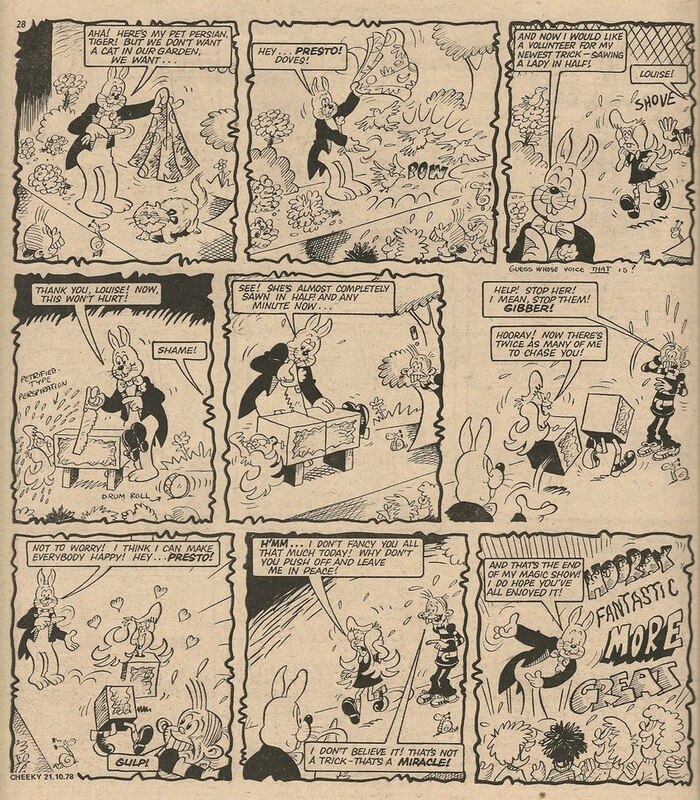 Cheeky continued to appear, but as a member of The Krazy Gang, who had moved into W&C when Krazy, the comic in which the Gang originated, expired in April 1978. 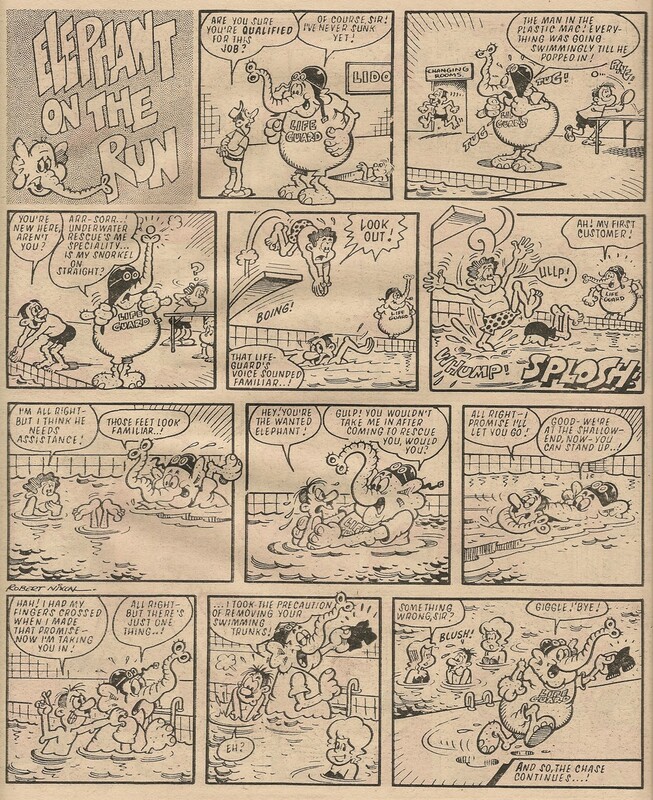 However, the Krazy Gang's Whizzer and Chips run ended in the issue dated 08 February 1986. A week after Mustapha Million was the subject of the unwelcome attentions of the Bumpkin Billionaires, the other Cheeky Weekly survivor of the time was unwitting host to an impudent invader of Whizz-kid origin. Yes, it's the rather dull Animalad strolling nonchalantly into the boys' lavs, carrying out his third raid on an ex-Cheeky Weekly character. He has previously intruded upon Cheeky (as a member of The Krazy Gang), and gatecrashed Mustapha Million. However the Whizz-kid shape-shifter was himself the victim of a retaliatory incursion by Mustapha. This Calculator Kid strip had first appeared in Cheeky Weekly dated 03 February 1979 (the 'big' issue). 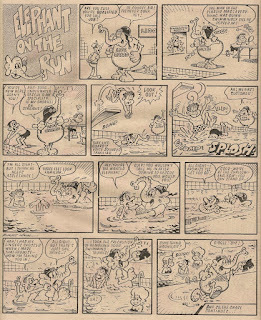 The superimposition of Animalad wasn't the only change to the page on its Whizzer and Chips outing – the trajectory of an unidentifiable object ricocheting off a kid's head in the first panel on row 2 was obliterated, Cheeky's graffito under the handbasin (row 3 panel 2) was removed while in the same panel Charlie's closing word was excised, and a change was made to Charlie's dialogue in the final panel. This last change was probably made because the original didn't make sense, since during the story Charlie didn't actually 'interfere with [Calc's] plans'. This was the seventh raid carried out on Calculator Kid up to this point, making Charlie the most-raided ex-Cheeky Weekly character. The dwindling survivors of the toothy funster's title had by this time suffered 18 raids and perpetrated 9. Those of you who follow my issue summaries series of posts will be aware that the most recent entry looked at the final issue of Cheeky Weekly's second year, so now is an appropriate time to examine the changes that occurred in the comic between its first anniversary issue and the end of year 2, and compare them with the changes documented in my Cheeky Weekly: Year 1 in Review post. 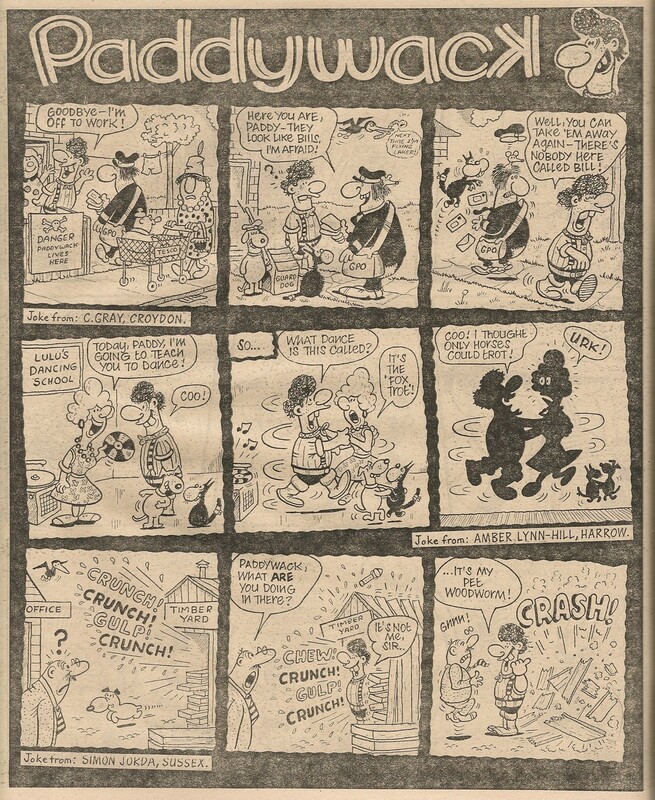 Cheeky Weekly's second year was of course marred by the December 1978 printer's strike that affected a number of IPC's titles and resulted in two issues of the toothy funster's comic having a reduced page count, plus the loss of 3 issues including what would have been the Christmas edition (although most if not all of the festive funnies intended for that issue did eventually appear in one form or another). 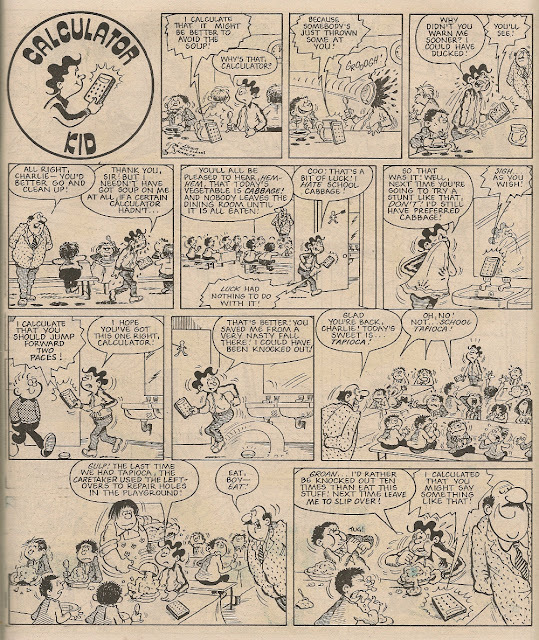 Cheeky Weekly was unique among British comics in being built around a single character whose strip was interspersed throughout each issue. But in addition to enjoying the toothy funster's gag-cracking progress through a whole week, readers experienced another unique aspect of the comic as all the non-Cheeky strips were framed by those Cheeky's Week pages. Thus the adventure strips were introduced as books Cheeky read or films he watched at the cinema, and the humour strips were presented as programmes he watched on TV or home movies made by his pals, among other conceits. 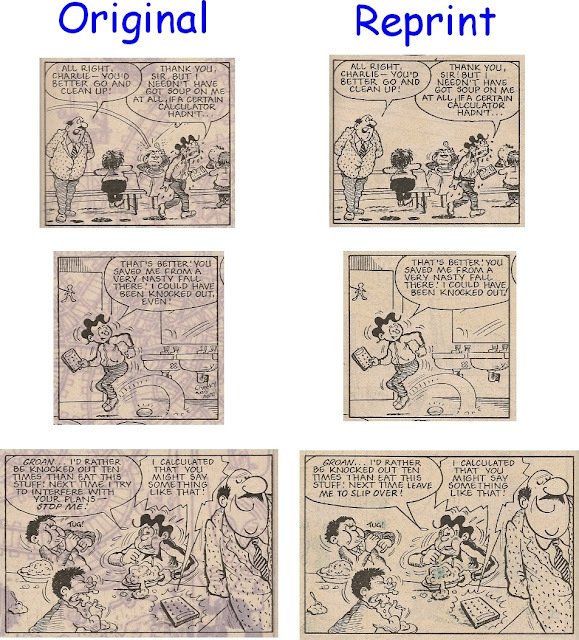 Aside from the loss of individual strips and the introduction of replacements, which is of course commonplace in comics as editors strive to hone the contents in pursuit of maximum circulation, the major change to occur in Cheeky Weekly's second year was the final elimination of the framing devices, a process that had begun in year 1, as documented here. The comic also underwent a third revamp during year 2, with the Mystery Comic section ceasing to appear in the centre pages as of the 07 July 1979 'New Look' issue. 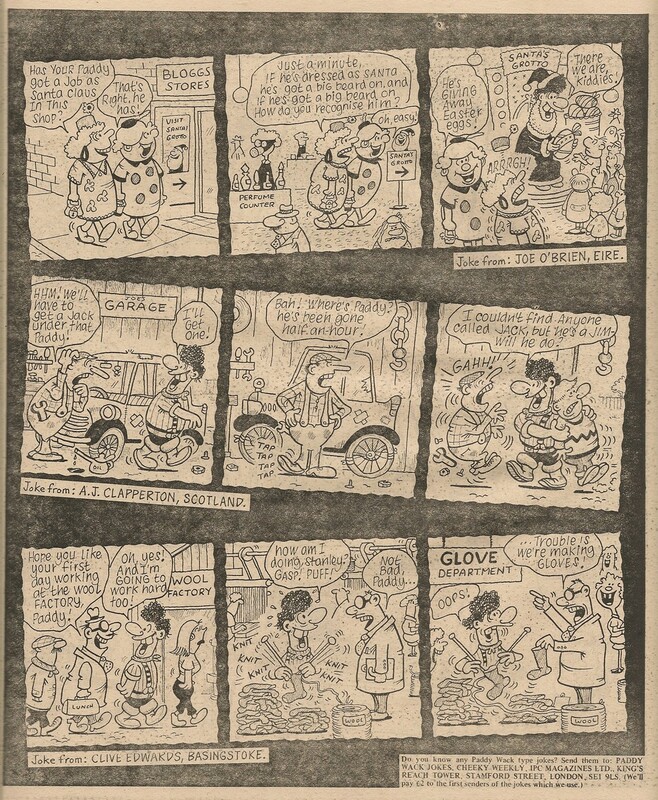 All the strips that had previously been contained within the Mystery Comic section continued to appear, but were distributed throughout the comic rather than huddling at the mid-point of each issue. Calculator Kid and Paddywack join the Survivors this year, having been categorised as Newcomers in the Year 1 review. 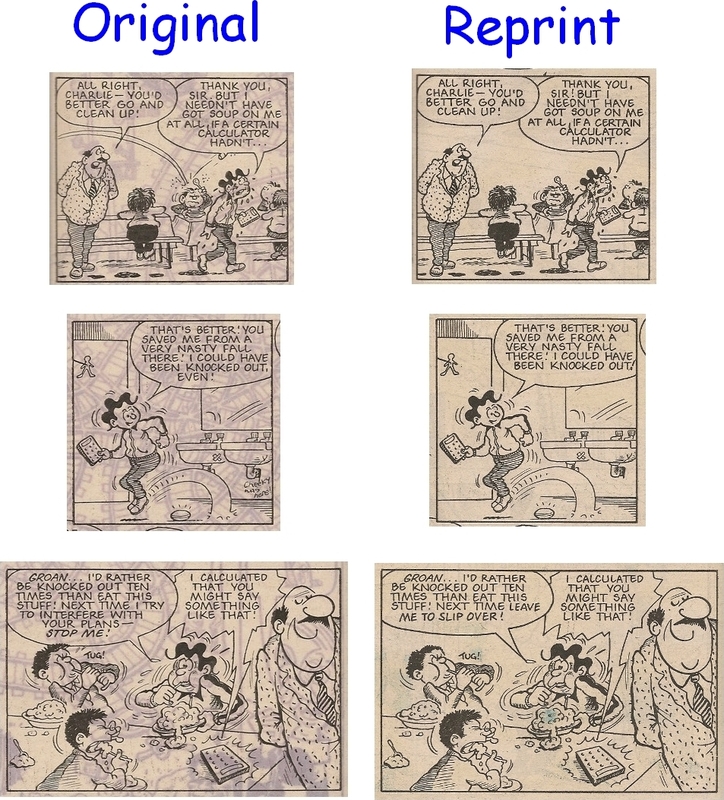 Also joining the survivors are the 5 strips that were introduced when the Mystery Comic took up occupancy in the center of the comic as of the 30 September 1978 issue (again these were classified an Newcomers at the end of year 1). However, one of those 5, Mystery Boy, only just scrapes in as a year 2 survivor, since its final episode appeared in the 13 October 1979 comic. Since Mystery Boy was not replaced by another story in the adventure vein, it seems that during year 2 a decision was taken to transform Cheeky Weekly into a funnies-only comic. There were in total 19 strips running as of the end of year 1 which survived to reach the end of year 2. This compares to 12 survivors at the end of year 1. 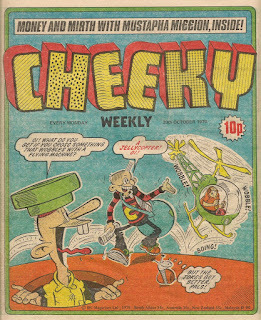 This more stable line-up may suggest that at the end of year 2, the Cheeky Weekly Editor was happier with the comic's contents than he had been just 12 months into the title's run. 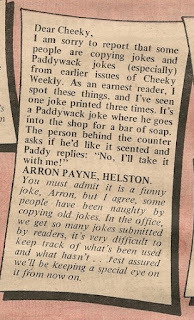 Cheeky Weekly was surprisingly late in adding a readers' letters page to its line-up - Chit-Chat didn't commence until issue number 60. It subsequently became a permanent fixture. 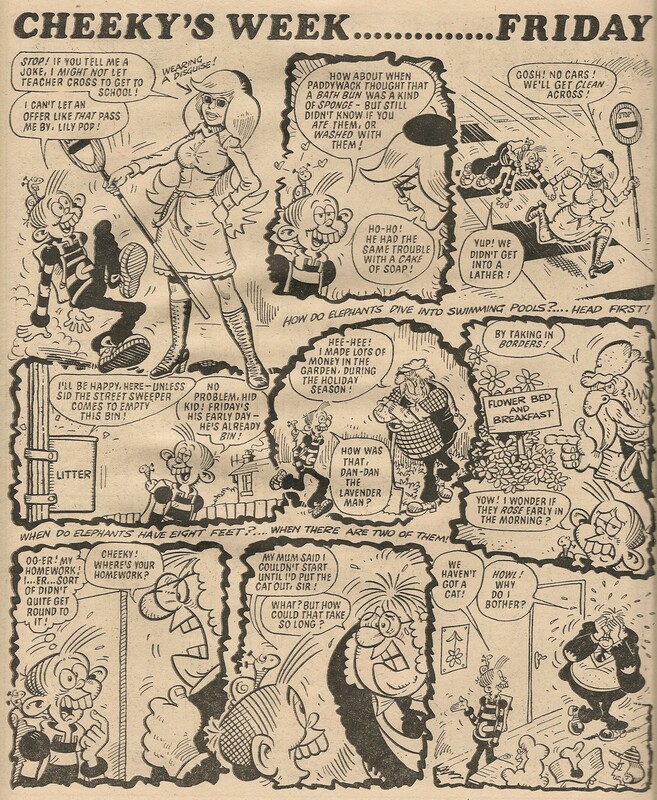 Snail of the Century was the last original feature to join the roster of Cheeky Weekly chucklemakers, all the subsequent strip debuts within Cheeky Weekly were reprints. Speed Squad were of course Skateboard Squad in all but name and vehicular specificity. Stage School was an engaging, fun feature that not only continued into year 3 but was among the strips that transferred to Whoopee! when the toothy funster's title came a cropper. The Gang was a poor choice of reprint that didn't do Cheeky Weekly any favours. Ringer Dinger was a reprint functioning as an intermittent filler. 12 Newcomers (i.e. strips that began after the first issue) were listed at the end of year 1, compared to the 7 above for year 2 (but since there were more survivors in year 2, it's to be expected that there would be a commensurate dip in newcomers). 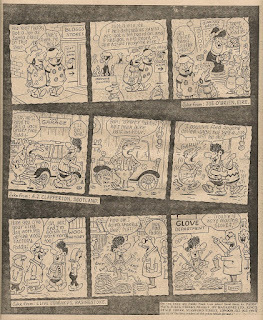 Cheeky's Pal Puzzle (my own title for a feature that was not given a name in the comic) was as the name implies a feature of the brain-teaser variety but, rather than being a generic filler as such items often were, it was given a Cheeky Weekly twist in that it was incorporated into the Saturday strip. Cheeky's Week in the table above refers to to cover strip of that name rather than the concept of Cheeky's 7 days of jolly japes. Hey Presto! 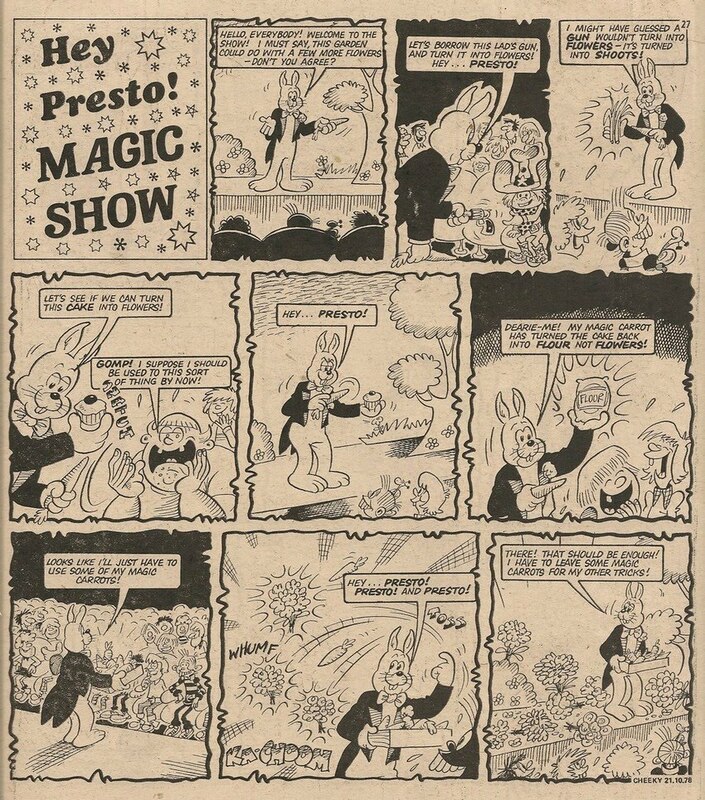 Magic Show was a one-off special strip to celebrate the comic's first birthday. The short-lived Laugh and Learn's interesting collaboration between Barrie Appleby and Brian Walker was possibly a little too educational for readers' tastes. Skateboard Squad of course arose, phoenix-like, from the ashes of their former plastic-wheeled conveyances to become Speed Squad. The Terrible Trail to Taggart's Treasure was a reprinted tale of piratical pursuit. Mystery Boy appears in this category as his final episode appeared in the 13 October 1979 issue. 13 features were dropped during year 1, but we again see a more stable comic reflected in year 2's tally of just 7 ejectees (one of which was a one-off special never intended, as far as we know, to be a series). The above is a bit of a rag-bag category which mops up everything that started and finished within year 2, including cut-out features, competitions and fillers of various descriptions. However, focusing on 'proper' features reveals that Eagle Eye, Menace of the Alpha Man and The Burpo Special all started and ended within year 2. Of those four, The Burpo Special was the only original material, and it's hard to see why such a memorable feature was dropped. The strip's premise of focusing on a different member of the massive Cheeky supporting cast each week would seem to give it almost unlimited potential. A grievous loss to the comic, considering it was sacrificed, as of the aforementioned 'New Look' issue, in favour of dreary reprint The Gang. Special mention must go to Star Guest, a promotional campaign that ran across IPC's humour line in spring/summer 1979. Year 2 saw a steady increase in the use of reprint material from 8 to 10 per cent (barring December 1978 which was no doubt skewed by the truncated/lost issues). By the end of its second year Cheeky Weekly had suffered a significant loss. 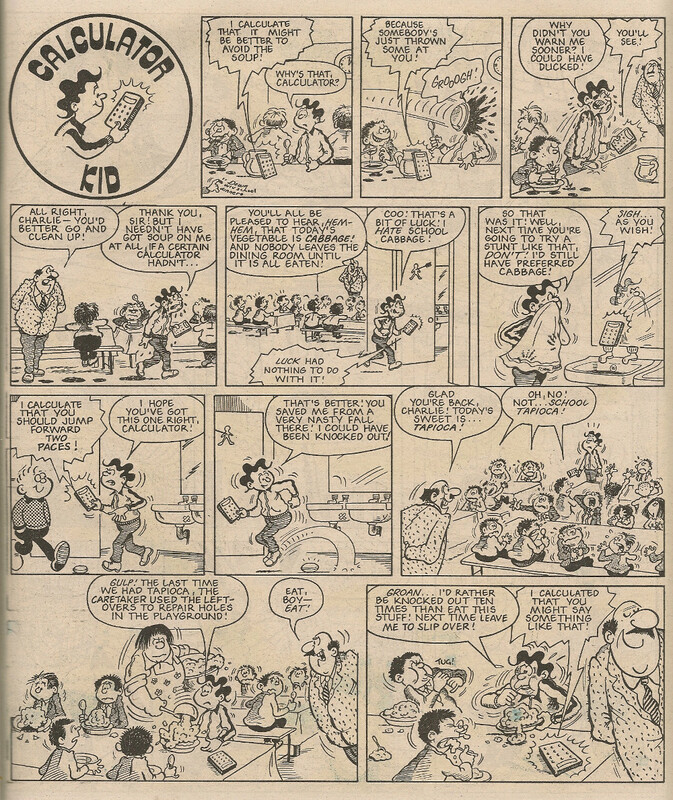 The elimination of all the framing devices had shorn the title of one of its unique properties and consequently, as of July 1979's New Look issue, the comic felt a little less special. The cull of framing devices had of course resulted in the concept of the Mystery Comic being dropped (although all the strips from that section continued), but the comic-within-a-comic idea was not a new one, nor would this be the final example of such a construct - indeed the Cheeky Weekly survivors who escaped the wreck of the toothy funster's title would find themselves ensconced in a Cheeky comic within Whoopee! 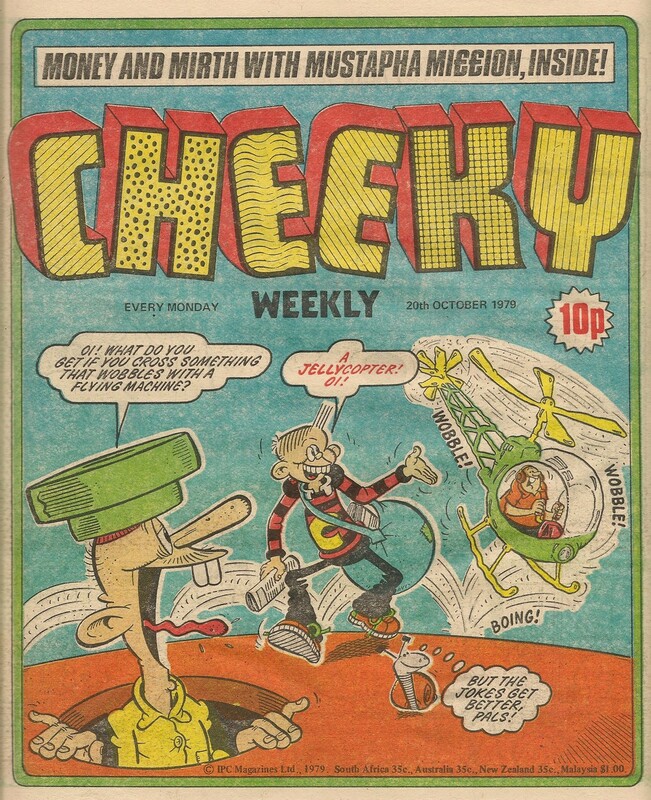 However Cheeky Weekly, on the point of embarking on its third year, retained one aspect that differentiated it from competitor titles on the newsagents' counters - the depiction of Cheeky's progress through a week of gags. Those Cheeky pages were still packed with energy and Frank McDiarmid's work continued to delight. In addition to the toothy funster's week-long joke marathons, the roster of non-Cheeky fun strips running at this time was, with the odd exception, a pretty strong one. To what extent the year 2 changes were made in preparation for the comic's eventual termination is open to speculation. Diminished, yes, but not mortally so, Cheeky Weekly marched on into year 3.